Business Listings are important for local businesses, and many SEO and marketing companies have discussed the importance of having complete business listing profiles and consistent business listings across the local data landscape. You want your business listed on the websites that matter like Yelp, Manta, Yellow Pages, etc because these websites pass important signals to Google about your business location and category. They also can transfer trust and authority signals which correlate to higher rankings. But are your business listings helping you? You might be surprised to find out that some are and some aren’t. In order for your business listings and local citations to improve your ranking ability, Google has to know about them. 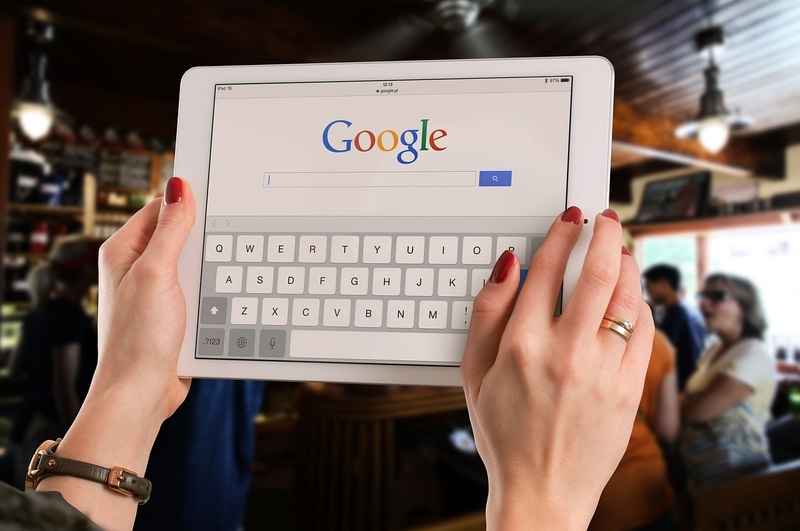 That seems obvious, but for many of the local business listing websites, it can take weeks or months for Google to discover and index these new listings – if ever. Over the last year, we tracked listing indexation using services like Moz, Yext, and Synup, to see how they compared to manually submitted business listings. We found that if we submitted our business to the top 50 local business listing websites, about 10% were indexed after the first month (4-6 listings), about 20% after 2 months (8-12 listings), and only about 35% after 3 months (15-18 listings). We know that Google has to discover our local listings to give us credit for them, so we needed a way to help Google discover these important links. 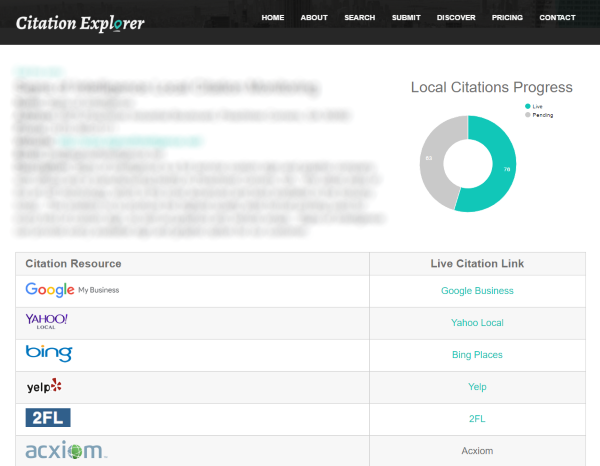 So we created Citation Explorer. Citation Explorer’s main purpose was to help Google discover our client’s business listings and local citations faster, which helps us increase rankings faster. We built a “Discovery” dashboard and linked to every one of the business listings we had published links for. This gave Google a page to crawl and discover all of the new links in one place which significantly improved how fast Google indexed our new links. We also track the number of links that are live VS the ones that are pending (not published yet). We also regular update the dashboard as we get new links published on these business listing websites. Below is a snapshot of the dashboard. Take a look at one instance of improvement using Majestic’s Trust Flow and Citation Flow metrics. This website started out with no Trust Flow or Citation Flow. Trust Flow measures how trustworthy your links are. Citation Flow measures how many links you have. These aren’t the actual number of links, but a measure of strength compared to other websites. The higher the numbers, the stronger the website. The test website started with 0 Trust or Citation Flow. After a few weeks, the Trust Flow and Citation Flow were significantly improved, and we found that over 80% of our business listings and citations had been indexed by Google. We also saw significant improvements in local rankings – specifically for the Google local business listings. We now add all of our clients to Citation Explorer as an extension of their SEO package to help us get better, faster results. This is currently a private utility of SEOteric, so only our clients get to utilize it at this time. The three biggest factors of local rankings for Google local business listings are location (distance), relevance, and prominence. From Google: Prominence is also based on information that Google has about a business from across the web (like links, articles, and directories). Google review count and score are factored into local search ranking: more reviews and positive ratings will probably improve a business’s local ranking. Your position in web results is also a factor, so SEO best practices also apply to local search optimization. We also have some great tools to help us attract new positive reviews as well (more on that later). If we do a great job influencing the metrics that Google sees as important, we will see our websites gain visibility in the search results – and that will help us drive new business. If you want help managing your business listings, or need help with SEO in general, we are here to help. Get started by filling out the form to the right to get in touch with a marketing specialist. You can also do a quick scan to see how your business listings stack up by visiting https://www.citationexplorer.com and running the business listing scan on the top 50 local business listings and data aggregators.